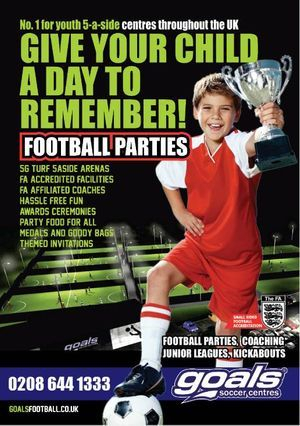 Every party kicks off with a full hour of football action on an outdoor 3G pitch, at one of our state of the art soccer centres. We've got a full selection of kids party favourites and a cake can be provided for the day at your request. The birthday child wins a "Big Match" trophy with medals and goodie bags available as extras for all guests. Our FA qualified coaches come highly recommended as an optional extra to make your child's day special. We handle the football, the food, and the entertainment - saving you loads of time. Leaving you to enjoy the special day.